It's time to announce our Top Three Awards for last week's "Give Thanks" challenge but first, we'd like to sincerely thank everyone who participated! As always your submissions were both creative and inspiring and we loved the use of Kraft cardstock and products from Kraft Outlet on your projects too! Thanks for choosing my card as a top 3! 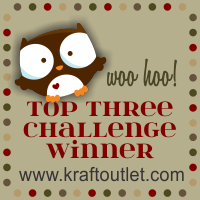 Thanks so much for choosing my card in the top 3! I'm so happy!